2 or more: $28.49 ea. 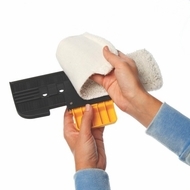 With this pair of replacement pads, you can keep cleaning with your Oreck Grab-It and Steam-It Mop. Reusable, simply wash them. Note - Mop sold separately. For Oreck Grab-It and Steam-It Mop (sold separately). Care instructions: Machine wash in warm water with liquid laundry detergent, air dry.